The 2018 edition of Indian Premier League (IPL) was the 11th season of the lucrative T20 tournament. The IPL 2018 was held from April 07 to May 27. 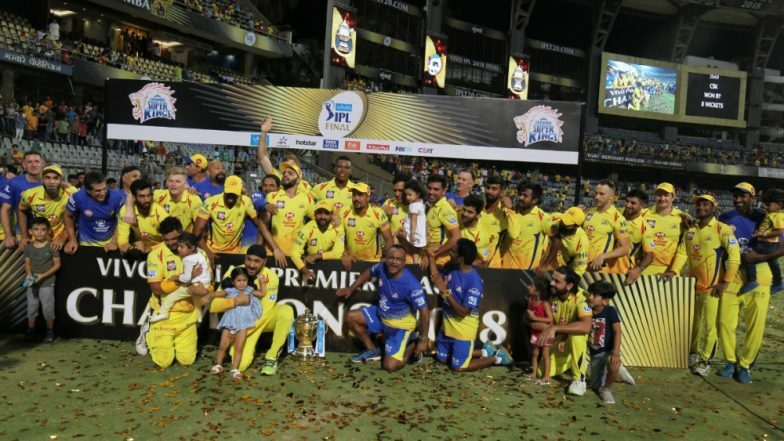 The 2018 edition of IPL saw the return of Chennai Super Kings (CSK) and Rajasthan Royals (RR) after the two teams were suspended for two years. The return of Super Kings and Royals meant that two franchises- Rising Pune Supergiant (RPS) and Gujarat Lions (GL) were discarded. MS Dhoni-led CSK went on to win the IPL 2018 title. IPL 2019 Schedule in PDF: Download VIVO Indian Premier League 12 Full Timetable With Fixtures, Matches, Team and Venue Details. Sunrisers Hyderabad (SRH) stand-in captain Kane Williamson emerged as the highest run-scorer in IPL 2018 as he scored 735 runs from 17 matches which included eight half-centuries. Andrew Tye playing for Kings XI Punjab (KXIP) picked most wickets- 24 from 14 matches. Kolkata Knight Riders (KKR) Sunil Narine was named as the Most Valuable Player for his all-round contribution. Playoffs: In the first Qualifier, Super Kings defatted Sunrisers by two wickets to qualify for the final. On the other hand, Knight Riders defeated Royals by 25 runs to advance to the second Qualifier. However, in the Qualifier 2, Knight Riders lost to Sunrisers by 14 runs. Final: The final of IPL 2018 took place between Super Kings and Sunrisers. Batting first, SRH managed to post 178 for 6 in their allowed 20 overs with captain Williamson scoring 47 off 36 balls and Yusuf Pathan contributing with unbeaten 45 off just 25 balls. In response, CSK chased down the total in 18.3 overs at the loss of just two wickets. Shane Watson scored match-winning 117 off 57 balls to guide CSK to victory. He was named Man of the Match for his century. This was CSK’s third IPL title, joint-highest with Mumbai Indians.